This summer there are ways to enjoy more time outdoors without even leaving your property! 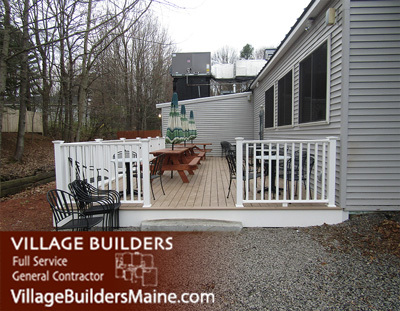 Let us build you a new deck or replace your existing one to enhance the value and enjoyment of your home. Call or fill out our request form to schedule a consultation. Learning some basic information about deck-building is helpful before diving right in, and we will be happy to explain your deck options and our process with you during your consultation. When we design a deck, the styles and sizes of each one are as varied as the homes they are attached to. Your vision, budget, available space and needs all play a significant role in the process we use to design & create a deck you will love for years to come. We take the time to understand what you are looking for and design a deck that fits your needs in a budget you can afford. 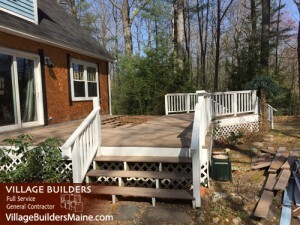 The warm months are short here in southern Maine, and adding a deck is a great way for you and your family to enjoy time outdoors with a private space for dining, entertaining or just relaxing. But, proper deck construction is essential for both function and safety. Hiring a professional to build your deck is not only recommended, but it is also important to protect your home and your family’s safety. Improperly attaching a deck to your home can put unwanted stress on walls and foundations resulting in structural damage and extra costs. Also, using the wrong materials or not building to current safety standards may result in injuries or fines in the future. 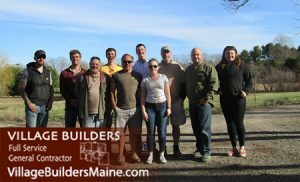 We’re committed to making sure your job is completed accurately and up to all current building codes and safety standards to ensure you get a fun, safe and useful outdoor space you can enjoy. The choices for your deck area are endless, including pressure-treated wood, cedar, redwood, composite, and vinyl. Each one affects the price, maintenance and lifespan of your deck. Understanding what you want to get from your new outdoors space is important for us to know to give you exactly what you have envisioned. Every deck has a lifespan, and there comes a time when your deck may need to be updated, may that be for your safety or simply for cosmetic reasons. If you have an aging deck that needs attention call us or fill out our request form to schedule a consultation. Our experts will come to your home and perform a thorough inspection, resulting in a quote that will hopefully satisfy your budget. Get in contact with us so we can start your new project immediately!